According to official sources, Lenni-Lenape Native Americans at one time used the land that is now Brookdale Park as a gathering place. Park construction began in 1928 according to a design by the Olmsted Brothers. It was completed in 1937 using laborers from depression era agencies including the Works Progress Administration. Today, in addition to many loop paths for hiking/walking, the park includes an extensive variety of outdoor features, such as a rose garden, rock garden, azalea walk, playground garden, rubberized walking/running track, and numerous athletic fields. 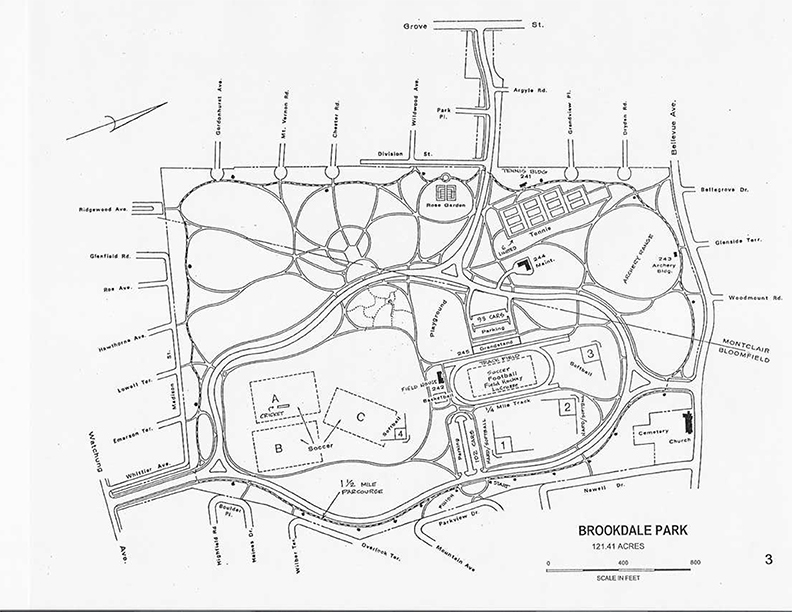 The Brookdale Park Conservancy is a volunteer-run, nonprofit organization dedicated to maintaining and improving the park that includes offering educational programs. The park contains more than 2.5 miles of mostly flat, paved marked walking paths. One is 1.5 miles (with parcourse stations) around the park perimeter, marked with distance posts as one travels counterclockwise. The other is a one-mile path, distance-marked counterclockwise, that roughly follows Circuit Drive within the park. A 1.3-mile section of the Lenape Trail (yellow-blazed), co-aligned with other trails in Brookdale Park, is part of the nearly 34-mile trail that connects most of Essex County's major parks. A posted map may be found just north of the 102-car parking lot on the east side. Both paths can also be walked clockwise, but without visible distance posts. For a map of the park, use the Web Map link on this site, where the parcourse is identified as a dashed line around the perimeter of the park. From the north or south, take Exit 151 of the Garden State Parkway and turn west onto Watchung Avenue. After driving by Broad Street look for the park entrance on the right at Circuit Drive. Use the intersection of “Watchung Avenue and Circuit Drive” when obtaining driving directions from the Internet (GPS Coordinates: 40.828543, -74.188186).